New Craft Class - Scones and Jam! I love these 1/12 scale christmas tree cupcakes which I made most recently. What I love about them was that they did really quite look like a real christmas tree (I hope)! They were also really fun to make! After this set, I have also made a pink set for Jackie and working on another set. I'm really happy because as I experimented more, I had further tweaked and refined the way to make it look better each time. Meanwhile, these have been SOLD ~~ Thank you Tracey! I really love green tea if you don't know it by now :) I love it so much that I know I HAD to add that into my array of 1/12 scale dollhouse miniature food. The leaf biscuit on the top of the green tea mont blanc dessert was an idea I had in mind. I like how pretty it sits on the top and hope you love that too. Sometime ago, I bought a Daiso Soft Clay, wanting to give it a try. I was quite curious to see and feel how it's like. I recently tried it and my first impression was I didn't like it. Unlike Hearty clay, this has a soft, powdery feel. Although it is soft, but no matter how you press or knead it, it crumbles, which means you can't really create or sculpt a proper shape out of this. With that said, I was not ready to give up and toss it away. Crumbly can be a good thing if you know how to further adapt and find a way to use it. I made a macaron with mostly Daiso Soft Clay, and waited till the next day to see how it feels like after it is dried. When dried, I was actually very pleased that it came out to be rather rock solid hard but still retain its lightweight properties. And then I tried a few more "concoctions". Try mixing Daiso, Hearty and Grace. Perfecto! Do give Daiso Soft Clay a chance...if you experiment it enough, you might find the beauty of it! I did! I just love the natural crumbly texture of it that I had to take a closeup photo! Last week was a super busy week. In between the customization work, I also had to prepare for some advertisement print. After looking at the dimensions that was given to me, I felt I would not be confident enough to tackle a rather big advertisement on my own. So I was on the hunt to find someone....someone whom I know that can deliver the style that is close to my heart. I found WinchesterLambourne and that was it! When I first saw her portfolio, I knew she was the one! I knew that I would be in good hands, and she would be able to present my style effortlessly. I've been keeping myself very busy lately with customization, which I'm very blessed and grateful for! In the midst of making the trays of dollhouse miniature macarons for Jackie, I wondered what if I make them into a wearable dessert jewelry as well? It fits all color outfits, and rainbow colors are sure to brighten up your mood. I feel so happy just looking at the colors. These lovely pink dollhouse miniatures french macarons were a request by Jackie :) I am so happy and honored to be making these special treats. This is the first time I had to make about 9 shades of complimenting pink and creams to fill in the trays - I sometimes wondered, how many more shades can I come up with before I ran out of ideas..
Macarons ready to be slot into the bakery shelves! If you would like these, please contact me as well. I'll be making some more soon, so look out for them! My fun experiments with colours lead me to this dollhouse miniature macaron display in 1/12 scale, and I'm pleased to show you this piece which I've recently completed. Even though it was just only french macarons, and you might think how hard can it be to make more than 200 macaron shells by hand from scratch...well it was still pretty time consuming. But it was really fun to make, and especially when the colours come to life! After I completed this, I found it extremely therapeutic to feast my eyes on this dollhouse miniature macaron display piece, just because my eyes are moving from my favourite sweet pastels pinks to the earthy soft browns, then to the yellows and then to the calming sea of greens and blue. And because all the shades are soft, it is a soothing piece of art. 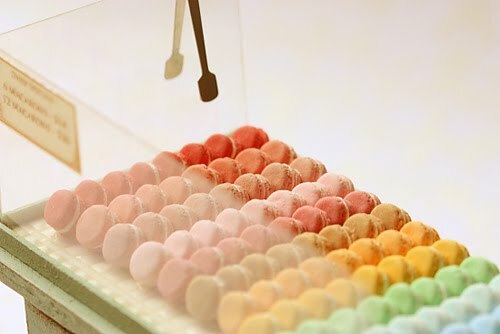 I like looking it from the side too, as I like to see the neatly stacked macarons waiting to be savored. 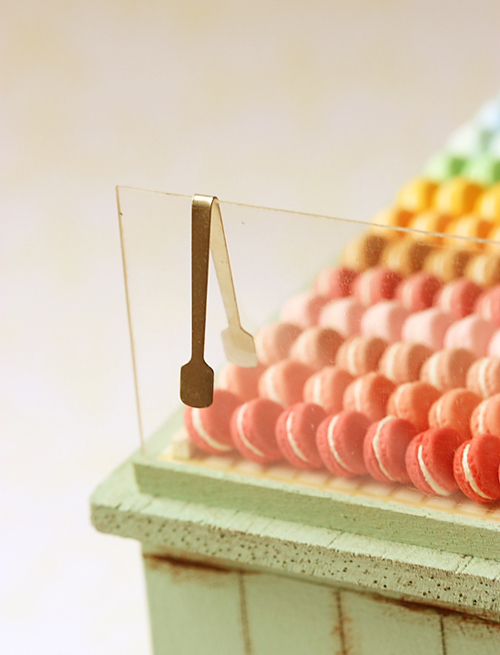 The macaron tong sits on the side of the display pane, ready to be picked up and be used! I hope you like this unique piece! 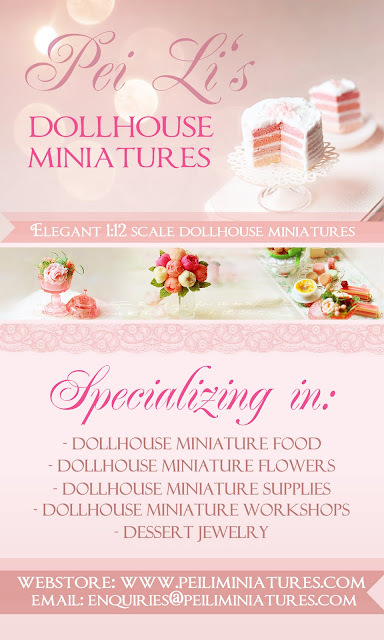 I'm pleased to add another new offering to my range of craft classes for dollhouse miniatures! 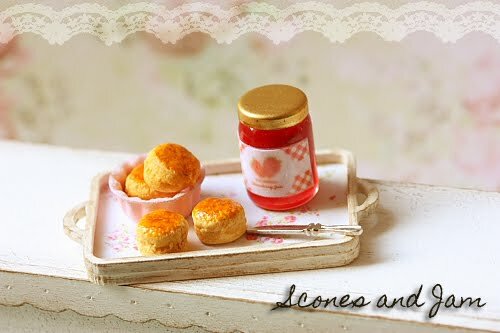 Scones and Jam was something I made last week, and I felt this was going to be pretty rewarding yet simple enough for beginners who would like to try their hand on creating dollhouse miniatures. With that, I present you Scones and Jam! Please check out my website for more details about this craft class.